Don't settle for skin that looks dull and lackluster. Get glowing skin with Weleda's Wild Rose Smoothing Night Cream. 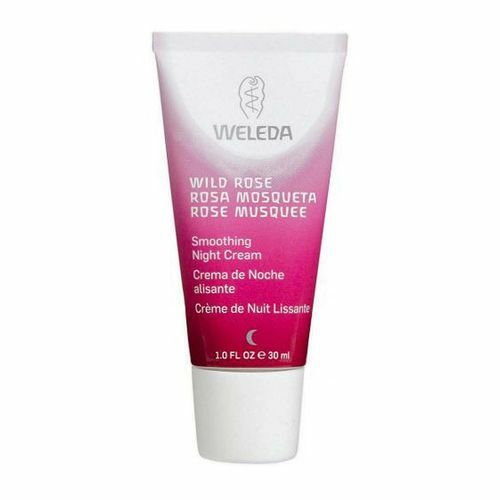 Weleda's Wild Rose Smoothing Night Cream is an all-natural face cream that repairs your skin while you sleep. It deeply moisturizes where your skin needs it most and improves the look of fine lines and wrinkles. Wild Rose Smoothing Night Cream contains a special blend of rosehip seed oil, antioxidants and vitamins to support your skin during it's nightly regenerative cycle. Give your tired skin a boost with Weleda's Wild Rose Smoothing Night Cream. Order it at eVitamins today for a great, low price! Warnings: For external use only. Do not ingest. Avoid contact with eye area. Keep out of reach of children. Notes: Contains no synthetic fragrances, colors or preservatives. Not tested on animals. Ingredients: Water (Aqua), Prunus persica (Peach) Kernel Oil, Prunus amygdalus dulcis (Sweet Almond) Oil, Alcohol, Lanolin, Glyceryl Stearate SE, Beeswax (Cera Flava), Olea europaea (Olive) Fruit Oil, Rosa moschata (Rosehip) Seed Oil, Oenothera biennis (Evening Primrose) Oil, Sedum purpureum (Orpine) Extract, Equisetum arvense (Horsetail) Extract, Commiphora myrrha (Myrrh) Extract, Xanthan Gum, Fragrance (Parfum), Limonene, Linalool, Citronellol, Benzyl Alcohol, Geraniol, Citral, Eugenol and Farnesol. Directions: Apply to face, neck and decollete at night after cleansing and toning. Massage in gently. Use only as much as the skin can fully absorb. To enhance the effectiveness of the cream, wrap the face in a warm, damp cloth for a few minutes. Excess cream can be removed with a tissue.